Bowling Green moved up one spot to 13th in this week’s USA Today/USA Hockey Magazine poll and remained 13th in the U.S. College Hockey Online poll. Both polls were announced Monday. In the USA Today/USA Hockey Magazine Top 15, the Falcons received 94 points, one more than a week ago. In the USCHO Top 20, BG received 430 points, up from 419 a week ago. 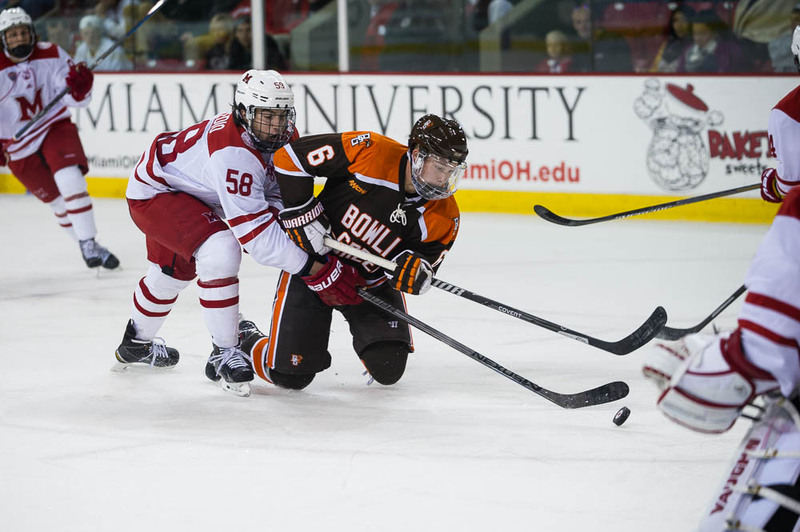 BG was idle last weekend and will remain off until Jan. 3-4 when it faces Robert Morris in a nonleague series. The teams play an outdoor game Saturday, Jan. 3 at noon at Fifth Third Field in downtown Toledo and at RMU Sunday, Jan. 4 at 7 p.m. The Falcons are 11-3-2 overall and 8-1-1 in the Western Collegiate Hockey Association. RMU fell two spots to 19th in the USCHO voting after splitting an Atlantic Hockey series at Mercyhurst. The Colonials, 11-2-3 overall, were 3-0 losers Sunday in Game 2 of the series.